The dreaded early morning wake-up! Most parents have gone through it at some point. Unfortunately, there is no snooze button on that alarm. An unexplained early morning wake-up can be difficult to navigate through, but rest assured that with some adjustments you can get back on track. First, let’s define an “early morning waking.” The rule of thumb is anything after 6:00 am is fair game for waking up, but nothing earlier is considered “morning”. In fact, I advise my clients to treat a 4:00 or 5:00 am wake-up the same way as they would treat a waking in the middle of the night. It is best to use your sleep training method until 6:00. If your child falls back to sleep by 6:00, great, let them sleep until 8:00 (but not later, it’s also important not to let them sleep too late). If they don’t fall asleep, I suggest doing a “dramatic morning announcement” at 6:00, which means opening the curtains, turning on the lights, and switching from stoic night-time parent to happy/fun daytime parent ready to start the day. Keep in mind that the first nap should be adjusted based on how long the child was awake in their crib before 6:00 am. Finding the underlying issue for early morning wake-ups is a process. Below are some troubleshooting tips to help you determine what is happening with your little one. I recommend starting with the first two, since they are the basics. The Sleep Environment: When it comes to the sleep environment it is important to make sure that it is as dark as possible. When the sun starts rising early in the morning it is especially important to keep that room dark until at least 6:00 am. Also, make sure there are no distractions in the room, such as anything that glows in the dark, lights up, or makes noise (other than white noise which I recommend). Self-Soothing: Another essential element to fixing the early morning waking is making sure that your child is falling asleep independently and without any props, such as a pacifier. 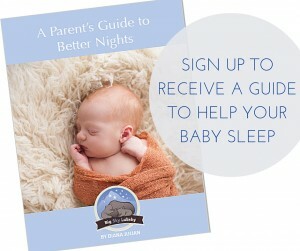 Creating a sleep routine that doesn’t rely on rocking or feeding to sleep helps your child become an independent sleeper. This means ALWAYS placing them in their crib awake, so when they wake during the night they know how to put themselves back to sleep. Earlier Bedtime: Contrary to what many people believe, another reason for early morning wake-ups is due to a late bedtime. If there is too much time between the last nap of the day and bedtime, this will result in a wake-up prior to 6:00 am. Early bedtimes are essential during a nap transition period or when working to correct a sleep deficit. Bedtime should be between 5:45 and 7:30 pm after a solid schedule has been established, otherwise it will be the culprit for perpetual early wake-ups. In addition, a child without a solid daytime schedule could show signs of their sleep deficit early in the morning. This is why it is critical to take into account the entire 24-hour schedule when it comes to sleep, and why we handle nap training and night training at the same time. Reaching a New Milestone: A milestone, such as crawling, rolling over, sitting up, standing, will almost always cause a disruption in sleep, many times the disruption is in the morning. There isn’t much that you can do other than give your child as much time during the day as possible to practice their new skill. This is always surprising to many parents, but your child will wake up and remember the new milestone immediately and start practicing right there in their crib. Night-Feeding: Another reason for an early morning waking could be due to hunger. If your child is consistently waking at 5:00 am and not going back to sleep I suggest offering them a feeding at this point. Especially if it has been 3.5-4 hours from their last night feeding. While some children naturally phase out night feedings all together, others still hold onto at least one until the end of the ninth month. While there is no one solution to the dealing with early morning wake-ups, with these troubleshooting steps you will likely find the cause, so you all can sleep a little longer in the morning.